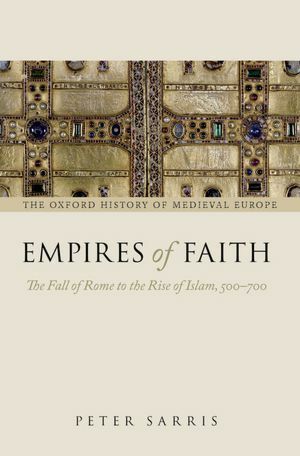 A very interesting looking history of two eventful centuries, Empires of Faith: The Fall of Rome to the Rise of Islam, 500-700 (OUP 2011), by Peter Sarris (Cambridge). The publisher’s description follows. Drawing upon the latest historical and archaeological research, Dr Peter Sarris provides a panoramic account of the history of Europe, the Mediterranean, and the Near East from the fall of Rome to the rise of Islam. The formation of a new social and economic order in western Europe in the fifth, sixth, and seventh centuries, and the ascendancy across the West of a new culture of military lordship, are placed firmly in the context of on-going connections and influence radiating outwards from the surviving Eastern Roman Empire, ruled from the great imperial capital of Constantinople. The East Roman (or ‘Byzantine’) Emperor Justinian’s attempts to revive imperial fortunes, restore the empire’s power in the West, and face down Constantinople’s great superpower rival, the Sasanian Empire of Persia, are charted, as too are the ways in which the escalating warfare between Rome and Persia paved the way for the development of new concepts of ‘holy war’, the emergence of Islam, and the Arab conquests of the Near East. Processes of religious and cultural change are explained through examination of social, economic, and military upheavals, and the formation of early medieval European society is placed in a broader context of changes that swept across the world of Eurasia from Manchuria to the Rhine. Warfare and plague, holy men and kings, emperors, shahs, caliphs, and peasants all play their part in a compelling narrative suited to specialist, student, and general readership alike.